The CEO of the South Bruce Grey Health Centre admits he would lose weight if restricted to eating his hospital’s proposed new diet of rethermalized food. “This makes the conditions of your challenge impossible for me to agree to,” he wrote. OPSEU had challenged the CEO and the VP of Labour Relations to spend a week eating the rethermalized food they are planning to implement for patients. 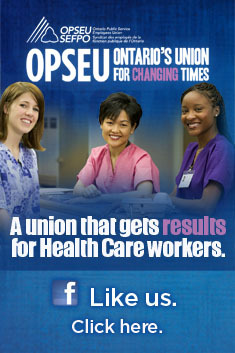 If the two were able to maintain their body weight, OPSEU would donate $1,000 to the hospital foundation. Davies suggested he may be able to find other board and staff willing to take up the challenge at $1,000 per person, but said he could not agree to revisit the hospital’s decision to replace fresh food service with rethermalized meals. Davies made no mention of VP Brenda Rantz, for whom the challenge was also issued. To prove the challenge was serious, OPSEU has decided to donate $1,000 to the hospital foundation to be used towards the purchase of new equipment. The union is arguing that the new rethermalized food system to be introduced by the hospital will be costly, less nutritious, displace local jobs, and deter recovering patients from eating. Serving frozen food also sends the wrong message around healthy eating, OPSEU says. The union is sponsoring a town hall forum about the hospital at 7 pm on Tuesday, November 2nd at the Victoria Jubilee Hall in Walkerton. Rollie Anstett, Brockton’s deputy mayor, will moderate the meeting. Speakers include OPSEU President Warren (Smokey) Thomas, Shane Jolley of the LocalMotive Project, Grant Robertson, former National Farmer’s Union Provincial Coordinator, and Dave Trumble, President of the Grey Bruce Labour Council. This entry was posted in Hospitals. Bookmark the permalink.